Have you read about the to-do in FragranceBlogLand? You can read about it (and get a few other links to other writings about it) here, but the upshot is that a few fragrance bloggers were theoretically paid in money or free scents to write positive reviews. My first, instantaneous thought was, "Well, hey, if someone wants to give me free stuff, I could do that!" But then I realized that I couldn't. It's not that it would ever come up: I'm a nobody, and there aren't any freebies coming my way except for the samples (rare and ever-rarer) that I can scrounge. But I wouldn't be able to write a positive review for something I hated, not even for money. I don't think I'm an inordinately moral person: I just couldn't misrepresent myself that way. I'm sure I have a price, but it's more than they'd be willing to pay, and it would have to be for something a lot more important. If the lovely people at Comptoir Sud Pacifique sent me a carton of all their scents and asked for some positive reviews, I could do that, but only for the scents that I'd have given a thumbs-up to anyway (or already have--Amour de Cacao, Vanille Abricot, and Aqua Motu, for starters). If they asked for a positive review of Coco Extreme, I'd have to pass. They don't have enough money to get me to praise that. I wrote about Vanille Coco a year ago, and I wasn't altogether impressed; it's boring. When I heard about Coco Extreme, which is supposed to be more complex and much more coconut-laden, I thought it sounded like just the thing. Island flowers, coconut flesh: almond, creamy hot milk, powdered sweet coconut flakes: candied sugar, "gentle tropical breezes", black vanilla pod. Doesn't that sound nice? Some people love it. But it's cloying; it's almost nauseating. The coconut note is stronger than the original Vanille Coco, all right: it's so strong and so perseverant that you feel as if you're surrounded by it and can't escape. The other elements--tiare flower, almond, and lots of sugary vanilla--only add to the suffocating nature of the scent. 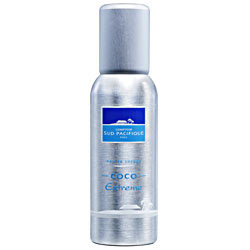 Coco Extreme is an attack fragrance. It owns you. It jams itself into your nose and it will not go away. It's what they call a scrubber: something you want to scrub off your skin as quickly as possible. (Even that won't work: scrubbers are notoriously hard to get rid of.) Is it the worst thing CSP has ever produced? I don't know, because I haven't smelled all of them. But it's certainly the worst I've ever tried from their line. As I've said before, I find Dolce and Gabbana's bottles just lethally boring, and the bottle for Sicily is no exception. (Their newest scent, The One, breaks the mold, finally; it's really gorgeous, even if it's been done before.) A thin block of clear glass, a tall black cap: it's not even minimalist, it's just perfectly functional and nothing more. The scent inside, though: that's really something. The top is a chilly bluster of aldehydes and bergamot. The first time I tried the scent on my skin, I was shocked: it's called Sicily, so how can it be this cold? It's reminiscent of the fresh coldness of Apres L'Ondee (though it smells nothing like it, of course). The cold is soon muscled aside by a barrage of flowers: the official notes are honeysuckle, jasmine, black pearl rose*, hibiscus, and heliotrope. I think there's a dose of carnation in there, too, or perhaps just some unnamed spices that give that clovey effect. What binds the whole mass of flowers together, gives it cohesion, is an almost shockingly strong soap note. Sicily doesn't even smell as if you'd just taken a shower--it doesn't have that clean fresh smell. Instead, it smells as if you'd just unwrapped a bar of really nice soap and held it in your hands. (I think this is where I get the carnation from: it's enormously suggestive of a brand-new bar of Roger & Gallet's Oeillet Mignardise, which is to say Carnation, soap.) It isn't a soft, potentially cloying floral; it's got a bit of an edge to it--nothing sharp or pointy, not a bite, exactly, but a few angles. What remains after a couple of hours is a vague petally aura atop a creamy, musky sandalwood base. If you don't like soapy scents, or florals, then Sicily isn't for you. (It isn't the sort of thing I'd wear, though I like to smell it from time to time.) But it's not your average floral scent (and not at all, thank god, one of the thousands of fruity florals that you can no longer escape). Dolce and Gabbana, however tedious their bottles, don't do ordinary scents; I may not love everything they release, but I always find that they're worth a try. *Wouldn't you think a black pearl rose would be black, or at least deep violet? It isn't. It's just bright red, with a slight violet cast to the underside of the petals. And how it differs in smells from other roses I couldn't tell you. I think--no, I'm pretty sure--that manufacturers make a point of telling us such things only to set their scent apart from others. "Those other perfumes just have plain old roses: we've got Black Pearl Roses!"